Welcome to Equestria Daily's Tutorial Codex! This page's intention is to gather as many tutorials as possible into one spot for easy access by beginning musicians, artists, crafters, ect so that they can improve their work and grow as the artists they are! Below you will find a variety of categories dedicated to certain areas of work so take a look and pick what interests you. Basically anything that can be used in a pony project! If you have a tutorial you would like to contribute, whether it be a video, a dA journal, a pictorial guide, whatever, please send it to [email protected] and put the subject line Tutorial-Whatever the Tutorial is About for easy sorting. Help us keep this section clean by reporting dead links! The Artist Training Grounds Alumni Group - Has a variety of guides available and an active community willing to help! Reddit Drawing School - Pick up tips and critiques for your art on Reddit! Art Thread on MLPG.CO (Warning, contains mature anatomical references) - A thread containing many references of different kinds for use, including mature ones if you are interested. Art Guides Tumblr - Massive tumblr filled with guides for a budding and experienced artist. Character Design References - Huge reference database on Pinterest containing almost any reference guide you can imagine. MLP VectorClub - Excellent resource for vector artists looking for help and guides. Ponychan Reference Guides - Huge art resource with all sorts of guides on not only drawing but using all sorts of digital programs. Massive Reference Guide Tumblr For Everything Possible (Warning, contains mature anatomical references) - The motherlode of references for anything you could possibly want to draw. Not necessarily pony but studying these can help from pony, to anthro, to humanized! The Pony Drawing Guide v2 - Massive guide to almost everything pony. Check this out if you're just starting! Tutorials by Nsio - Massive detailed guide on everything from perspective, proportions, 3D and more. Contains some mature content. Loomis Art Guides - Free professional grade guides for any level of artist. Muffinsforever Guide - Contains basics on drawing ponies and basic coloring. Unicorn Magic Glow - Information on how to draw unicorn magic glow in Inkscape. Super Paint Tool SAI Guide - As it says a huge guide on how to use SAI. How to Draw Folds in Fabric - Rarity will love this one! Foreshortening Video - A guide on proper perspective. Style Guide - Info on 'switching' styles. Pose, Body, and Leg Guide - Detailed look at the body, poses, and legs. How to Draw Ponies Guide - A basic how to guide on basic pony shape. Wings Guide - Tutorial on how to draw wings in different positions. How to Draw Pony Heads - A pony head drawing guide. How to Draw Ponies Guide on Paper - Pony drawing guide how to draw a pony on paper. Deathy Glimmery Pony Eye Guide - Guide taking your pony eye from paper to digital. Deathy Glimmery Inking Tutorial - How to start inking your pencil sketched drawing using digital methods. Gen4 Anatomy Notes - Nose - Eyes - Legs - Head Size - Misc - An amazingly detailed guide on all things pony! Drawing Ponies by Wolframclaws - Detailed small guide to drawing ponies. 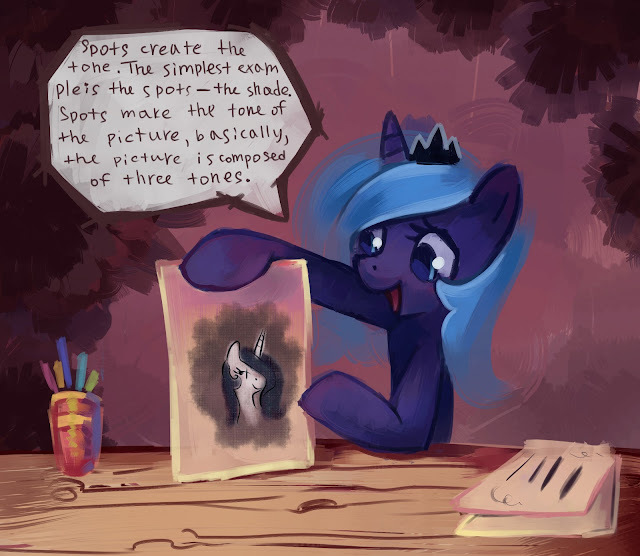 The Pony Drawing Guide - Interactive Flash guide teaching the basics about pony drawing. How to Draw in EqG Style - Video guide on how to draw your very own EqG characters. Making an Interactive Comic - Give some life to your comics with this tutorial. Lineart and SAI Tutorial - An in-depth guide to lineart, especially in SAI. How to Draw Clouds - Nice guide for creating clouds digitally. How to Draw Eyes by Rain-Gear - Learn how to digitally create realistic eyes! Metal Tutorial - All you need to know on how to make realistic metal objects. Tiaa's Anything Tutorials - Part 1 - Part 2 -A tutorial that overs everything from concept to completion. How to Draw Hair - A handy guide on how to draw pony hair. How to Draw Eyes - A good guide on how to make believable eyes. How to Draw Vegetation - Ponies like well drawn vegetation to eat! Figure Study Using Cosplay - How to use a cosplay reference photo for figure study. Yakovlev-Vad Perspective Tutorial - Learn perspective from one of the best pony artists! Yakovlev-Vad Wings Tutorial - Learn how to draw them wings! Yakovlev-Vad Texture Tutorial - Give your drawings some life with some texturing! How to Draw Ponies in Digital and Traditional Mediums - Simple guide on how to draw ponies. Eye Tutorial for Different Creatures - A simple tutorial to help give you realistic eyes for ponies and more! How to Draw Pony Heads and Bodies Pt 1 - 2 - Tutorial from the creator of Dash Academy herself! Pony Anatomy with Pixel Prism - A tutorial straight from the artist for Twilight's Ship Fic! Turning a Pony Image Into a Coloring Page - A quick tutorial on how to turn an image of pony into a coloring book page. Drawing Guides by Viwrastupr - A bunch of guides created by popular fandom artist Viwrastupr. Eye Shape Guide - A guide on retaining eye shape from the creator of Dash Academy. Consistency and Style - A guide by Aurelleah on how to keep your ponies consistent and stylish! Youtube Pony Hair Guide - How to draw different pony hair by Petrinox. SorcerusHorserus' Guide to Pony Bodies - An in-depth guide on how to draw pony bodies from the creator of Dash Academy! SorcerusHorserus' Guide to Pony Heads - An in-depth guide on how to draw pony heads from the creator of Dash Academy! Basic Shading Guide - Basic instructions on how to shade objects. Another Basic Shading Guide - Photoshop Specific! Digital Coloring Guide - Introduction to coloring. Photoshop specific! 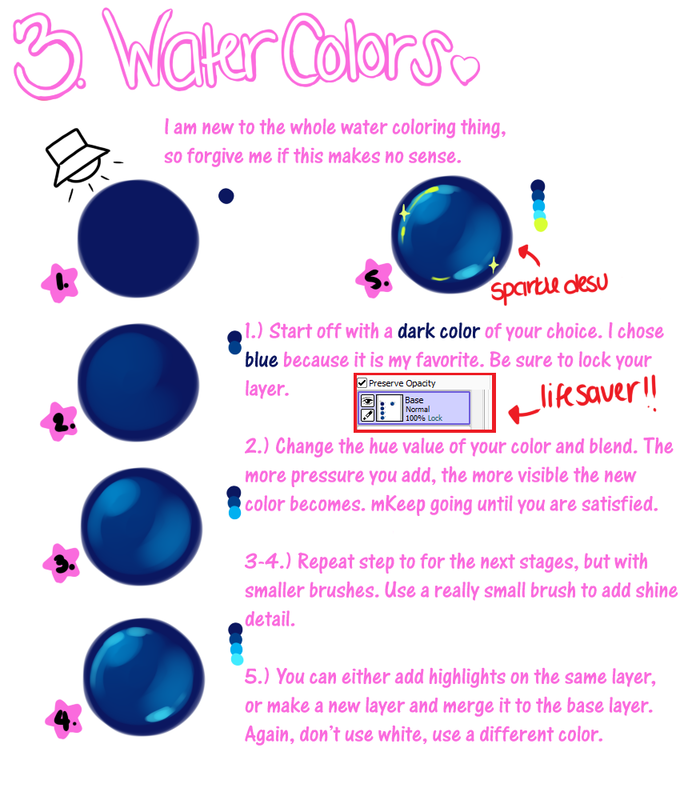 Coloring Water - Basic guide on how to color water effects. Recoloring Ponies Quickly in Flash CS5 - Need a recolor? Here's a guide how! Hair Coloring Tutorial - Learn how to give hair the proper look. What are Vectors? - A guide clearing up the confusion on what vectors exactly are. Complete Vectoring Guide - Video guide containing info on how to vector all parts of a pony using Inkscape. Another Vectoring Guide - Another vector guide that also uses Inkscape, but also goes into introductions on setup before diving into vectoring. Vector Stroke Width Tool in AI - Vector guide for Illustrator CS5. Vector Guide Using Photoshop - A Photoshop specific vector guide. Photoshop Tutorial - An Introduction - A beginners guide to Photoshop. Photoshop Tutorial - Tools and Starting - An overview of tools and getting started. How to Draw Ponies in GIMP - Step by step guide on how to draw your ponies in GIMP. Paint of Persia - Program that lets you "draw on any window, wallpaper, or anything you want!" Making a Youtube Career with WeimTime and Doctor Wolf - Learn some advice from two big pony Youtubers on how to get your channel off to a good start. Ponies in Aftereffects - Adding ponies in real life to video using Aftereffects CS6. Ponies in Photoshop - Adding ponies in real life using Photoshop. Pony SFM - A huge site dedicated to helping you get started and provide resources for pony SFMs. SFM Tutorials From Argodaemon - Tons of incredibly helpful tutorials from a pony SFM pro. A must see! SFM Cel-Shading Tutorial - How to cel-shade in SFM. Animating Skins and Body Groups - Animations tips in SFM. Animating Physics - Animating physics is SFM with the sfmphys script. Cross Copying Limbs - Copying motion across different pony limbs to speed up animating. Wings Opening/Closing - Tutorial on how to open and close wings on your pony models. Making Body Parts Invisible - A how to on how to make certain body parts invisible. Making Comics in SFM - A guide on making comics using SFM. SFM Tips - Tips from one of the best in the biz! Material Overrides - Learn how to modify your textures with altering the original material. Illum Position Tutorial - Learn more about lighting from Argodaemon! Lighting Tutorial - Learn basics of lighting from Argodaemon. PMV Today Guide Archive - Massive guide archive on everything PMV! PMV Lip Synch Guide - How to lip synch your PMVs. Vanishing Guide - A guide on how to make a character or object vanish in a video using Aftereffects. Piano Tutorials - How to play certain pony songs on piano (found in gallery). Hard Electro Bass - Instructions on how to do hard electro bass in Massive. Piano Arrangements/Transcripts - How to arrange and transcribe pony music. Basic Vocal Recording - Equipment and Setup - What you need to start recording! Basic Vocal Recording - Mixing with Audacity - Post processing guide. Flash Assests Compilation - A compilation of flash assets for animators. Flash Puppet Collection and Tutorials - Various resources for the starting animator in Flash! The Basics of Animation by FearingFun - Learn some basics of animation. Flash Fundamentals - A tutorial on Flash by one of the animators at Silly Filly Studios. Hair Styling Guide - How to style pony hair. Basic Customizers Guide - How to customize a pony. Airbrushing a Pony - How to properly airbrush a custom pony. Mix Ratios for Painting Ponies - A guide to help you figure out the proper ratio you need for airbrushing. Masking Prep for Painting - How to mask your ponies during the painting process. Pony Hair Styling Guide - A hair styling guide for Pinkie Pie brushables. Making a Pony Themed Duvet Cover - Exactly as the name suggests! Stripping Paint from Pony Toys - How to remove official paint to prep your toy for customization. Youtube DIY Custom Videos - A channel by a custom maker detailing a variety of customs in DIY videos. Sculpting Guide - Part one of a five part sculpting guide that teaches a person how to make a sculptures with wire skeletons. Sculpture Tutorial - From conception on paper up to the sanding stage. How to do Analysis - The how tos of analysis. Comprehensive FiMFiction Guide - A guide with tons of info for the beginning pony fanfic writer. Comprehensive Fanfiction Guide - Tons of info for the beginning fanfiction writer. MLPWritersWorkshop - A Youtube series interviewing a variety of fanfic writers, reviewing fanfics, and providing writing themes. Storytelling Lectures - Lectures by Brandon Sanderson who wrote the Wheel of Time books detailing tons of information on storytelling. Elkia's Awesome Additions - An expansion on the general guide for writing by Elkia! Pony Ears Origami - Make your own pony ears from paper! How to Make Pony Fetlocks and Hooves - Part 1 - Part 2 - Part 3 - A detailed guide on to sew your own pony fetlocks on hooves on your plushie. Pony Sewing Tutorials - See what it takes to sew your own pony plushie in this wonderful tutorial series. How to Wash Your Minky - Guide on proper washing technique for your minky pony. Sewing Gummy Plushie Tutorial - A Guide on how to sew your own Gummy Plushie! Very Basic Guide to Voice Acting - A quick guide to getting started with voice acting. Workflow for Finding and Using Sound Effects in Fanfic Readings - Guide on how to use sound effects in audio book readings. Fan Voice Actors - How to Improve Your Voice - A helpful tutorial on how to improve your voice acting skills. Making Pony Hoodies - Awesome little guide that details how to make a pony hoodie. Making Simple and Realistic Hooves - Part 1 - Part 2 - Part 3 - Excellent guide to make yourself some hooves! Makeup Tutorial - A guide on how to apply makeup to yourself to really make your cosplay shine. Putting Cutie Marks on Your Pants - A short guide to putting cutie marks on your pants! How to Play the MLP CCG - Having problems figuring out how to play the game? Check here!